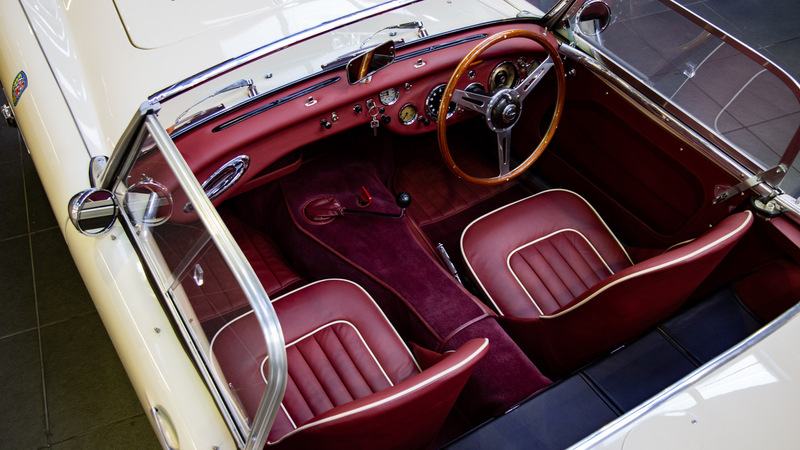 In the 1950s, the simplest way to go racing was to buy a standard sports car and hand it over to a specialist who was able to work some magic and make the car go faster than its manufacturer intended. Most talented amateurs did just that. Among them was the owner of a sleek Austin-Healey 100/6 who bought his car in November, 1958, namely Mr. C.W. Andrews. 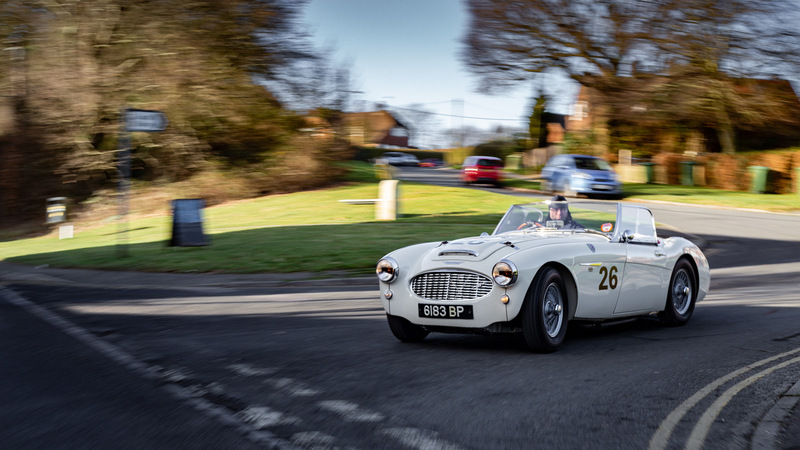 His white Healey with red trim was then sent to Ruddspeed, the "speed shop" which at the time specialized in making those British sports cars into potent track weapons. The car, registered 6183 BP, was powered by the 2.6-liter inline six cylinder engine derived from the C-series unit which previously powered the Austin Westminster, and which had been designed by the Polish engineer Tadek Marek (the same one who later famously designed an inline six and a V-8 for Aston Martin, with the latter remaining in production until 1999!). 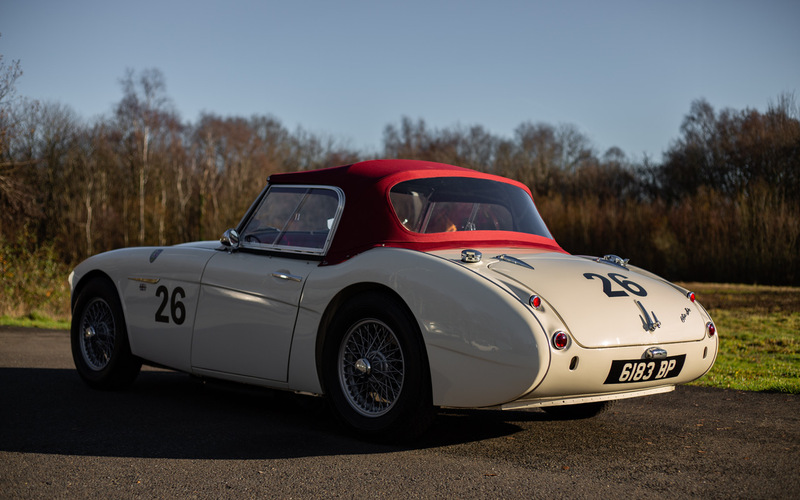 K. Rudd made the following modifications to the BN6 Healey: 4-wheel disc brakes were installed, a side exhaust, the engine was uprated to 170 hp and had triple SU carburetors installed, the car received uprated suspension parts and a thicker front anti-roll bar, plus a modified exhaust exiting under the passenger door. The first owner raced the car extensively, with a number of races entered and finished at Goodwood. A competent driver, he also raced an AC Ace-Bristol, a Healey 3000, a Cooper Climax and a Lotus 18, quite a variety of types. 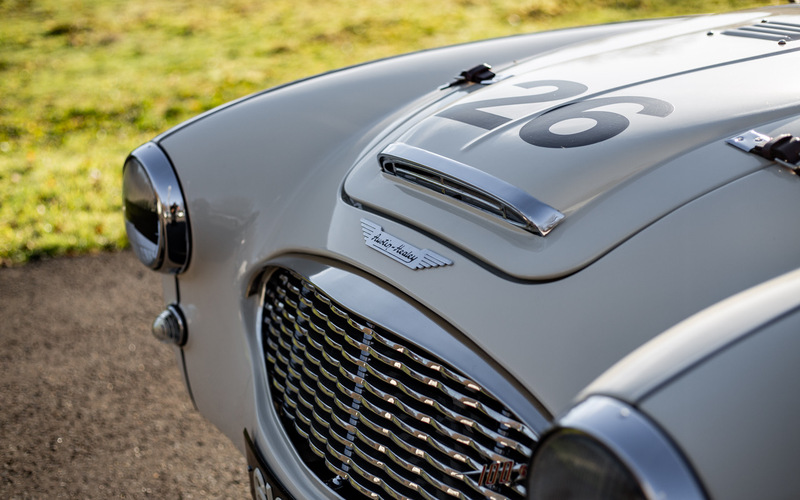 After many years this historic car was painstakingly restored, and raced with gusto on the same Goodwood Racing Circuit where it had had its maiden outing. Some time passed, and the current owner suddenly decided to restore the car again, while converting it to road spec: a rare enough occurrence. The job was entrusted to CKL Developments in Battle, East Sussex, UK, a company usually associated with racing Jaguars, but equally capable of sympathetically restoring just about any classic. 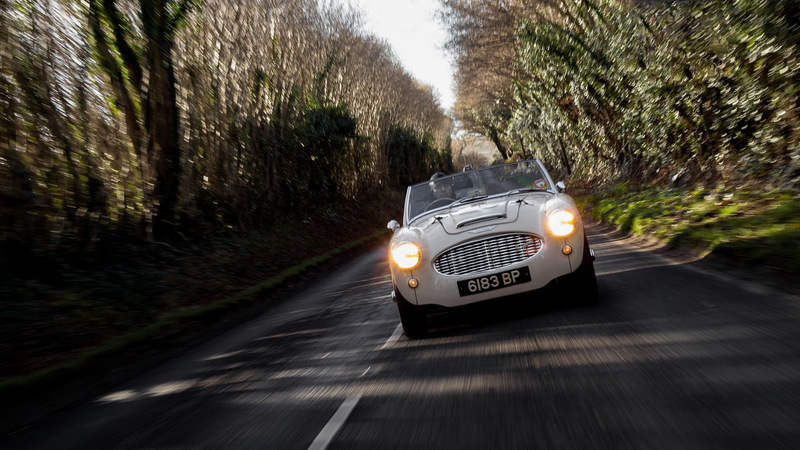 The result is staggering, and I am quite happy to be the only journalist to have been permitted to test the sleek Healey on public roads. The first impression is of a car so painstakingly restored that it looks almost too good to venture out on the open road. Almost. The conversion of the BN6 to road spec cost a staggering amount of money, and every penny spent seems fully justified: the fit and finish are on par with the work of a talented silversmith. What differentiates this car from many others is the bits you can't see: the level of detail under the dashboard, behind the seats and so on is just in another league. Normally I will drive anything with wheels on it without any reservations, but here I hesitate: what if the pristine, incredibly smooth bodywork is suddenly marred by scratches caused by road debris or stones thrown up by the tires of another vehicle? I need to forget the value of the car, and just climb in and drive. 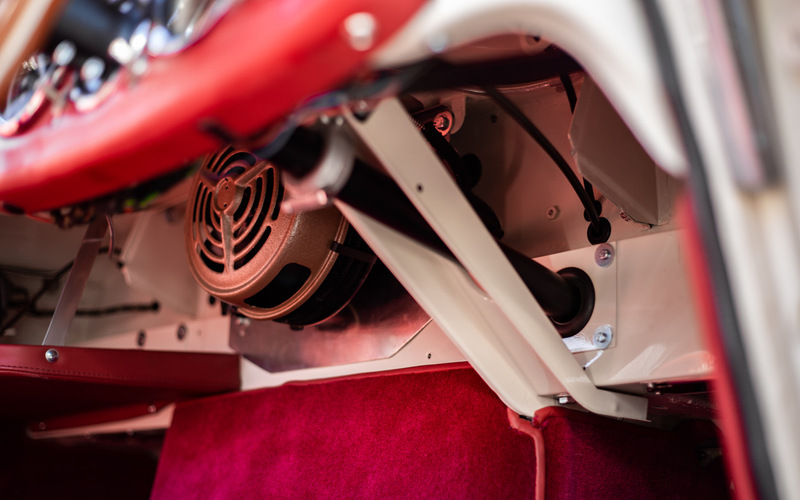 The engine starts with an angry thrum, and settles down to a slightly lumpy idle, typical of engines with a serious motorsport pedigree. I slot the first gear in, and release the clutch gingerly. I move off with little grace, well, I need some time to get used to the clutch bite point and the engine characteristics. At the moment it looks like I can't drive, too clumsy. Once on the move, however, I quickly gain confidence, and start to exercise the car a bit more. The engine is a marvel: strong, with fantastic midrange torque, and a throaty, characterful exhaust note. The Polish engineering heritage is just an added bonus. The action of the gearshift matches the engine perfectly, and I push the accelerator pedal down. This Healey could shame a lot of today's hot hatches, it's so rapid. It also looks and feels like a real car, and that is precisely what I savour on my drive. The chassis is tautly sprung, and has a rather unforgiving nature, with the car following ruts in the road and reacting in an immediate manner to all steering inputs. This elegant machine is not for the faint-hearted, nor is it the right car for people who can't concentrate for long periods of time: not a relaxing grand tourer, but simply an uncompromising sports car with which to cover challenging roads with total commitment. Slightly skittish over broken tarmac, it rewards the driver who displays unflinching skills and who is in good shape himself: this car is physical to drive, and proud of it. My drive ends all too early. I must admit I am not really a fan of the Big Healeys, but this car is the very opposite of many of the survivors of the breed: it is beautifully finished, tough and fast, and a titillatingly challenging drive. It can also transform a cold and sunny day into an adventure which sets the mood for the week that follows. Worth every penny, then. Many thanks to Rupert Manwaring and the helpful staff at CKL Developments Ltd. for their invaluable help (ckl.co.uk).